Before starting to create a new Visual CSharp application project with Visual Studio 2008, please refer to the article on how to setup development environment here. 3. In the Project types pane, expand Visual C# node and select Smart Device. In the list of templates, select Smart Device Project. 10. Click on Form1. Change Text to "VCSharp demo"
12. 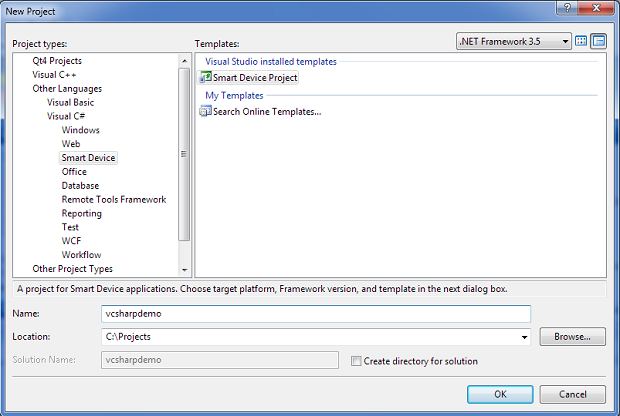 To build the VCsharp application project, in the Build menu, click Build Solution. 14. In the Deploy vcsharpdemo window, from Device, select Colibri600 ARMV4I Device if you are running Windows CE6 on Colibri. For users running Windows Embedded Compact 7 on Colibri, select SDK2wince7 ARMV7 Device. Deploying process will take 1-2 minutes. 15. After deploying, on the Colibri module, open My Device. Select Program Files. The vcsharpdemo folder contains a .exe file to run the application.